Entrusted Heritage: What's for Breakfast? If you're like me, there are mornings when allowing the kids to have cold cereal is the easiest way to start the day. Whether it's been a long night (say, up with the baby) or it will be a long day...cold cereal CAN be healthy! It's called: granola! The great news is that you can make it yourself, adding wholesome and nutritious ingredients while tailoring it to your family's nutritional needs. Don't believe me? Read on! I've created lots of different variations of granola for our family: "Pum-Berry Granola" (full of yummy raw pumpkin seeds and cranberries), "Fall Harvest" (with maple, pecans and apples), "Almond-Cherry," "Tropical" (mangoes and coconut), and "Cinnamon Bun" (cinnamon, nuts, and honey). Mmmmmm! 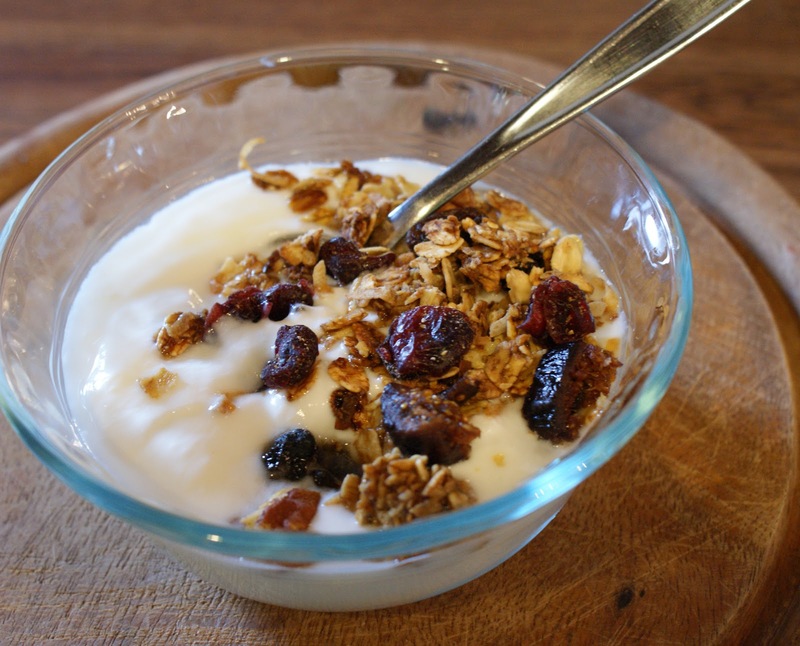 Granola is one of the most versatile foods in my opinion. You can use it to top your homemade yogurt or Greek yogurt, as a streusel topping (with butter added), or as an addition to fruit desserts like baked apples or fruit salad. The possibilities are truly endless. The most important thing to know about making granola is the ratio of wet/dry ingredients. I learned this from one of the best "cooking-from-scratch" recipe books, More With Less! Knowing this, and the basic method, you can change ingredients and tweak the recipe to your own taste. The dry ingredients would mostly be made up of your oats, of course, but could also include nuts, seeds, freshly ground flax seeds, wheat germ or bran, unsweetened coconut, wheat flour, other fresh whole grain flours, spices. The wet can include your choice of sweetener(s) (honey, molasses, maple syrup, pomegranate molasses, agave, applesauce, fruit sauce, apple butter, apple juice concentrate, etc), fat (coconut oil, canola oil, walnut oil, butter, peanut butter, etc) and other flavorings (vanilla, etc). I do not include the dry fruit as part of the dry ratio because I add these at the end of the baking. *note: I choose my spices and add these to the wet ingredients instead of adding them here. Add wet ingredients to dry ingredients and mix well. Pour granola into two 9x13 inch pans (metal seems to brown the granola faster than glass). You want to try to keep your granola no thicker than 1'' so that it can toast evenly. Bake at 300 F for 1.5 hours. Set your timer for 20-30 minute increments so that you can check for browning and stir the granola around each time. Bake until granola is light to medium gold color. Cooking times will depend on the size of pans you use as well as on your oven "character." The key here is to check frequently! Once done, sprinkle with 1 cup of dry fruit and allow granola to cool before storing it. I store mine in easy-to-pour plastic containers. Let me know if you have tried any yummy granola variations lately! Lo-Fat variation: Whenever we were on the "Daniel Fast," I made a batch of granola that didn't have fat (from added oils) in it and it came out really well. I simply omitted the oil and added applesauce instead. It tasted great!